The Spohrs Are Multiplying On her eighth birthday, she must choose. On her eighth birthday, she must choose. Maddie was born into a rabid baseball family. My parents were kids when the Dodgers moved to LA from Brooklyn. My mom and her sisters used to be driven to games in San Diego and San Francisco by my grandma. My dad went to games with his dad and siblings, and my parents even had some early dates at Dodger Stadium. I don’t remember my first baseball game, but I do have a memory of sitting in the Right Field Pavilion at Dodger Stadium with my family. I was wearing a Blue Crew t-shirt and I had a blue megaphone from an old Halloween cheerleading costume. At one point, I stood up and screamed into my megaphone, “GO FERNANDO GO!! !” He wasn’t pitching that day. My parents must have been delighted. I watched the 1988 world series with my whole family, and the day after Gibson hit The Home Run, I went to school decked out in home-fashioned Dodger gear (think pieces of paper with the word “Dodgers” written in crayon taped to my clothes). We’re a pretty dedicated group of fans. It’s not just my side of the family, though. Mike’s dad grew up in The Bronx when New York could boast three storied franchises. Mike’s grandpa took his kids to games all the time, and caught the foul ball Bobby Thompson hit just one pitch before his Shot Heard ‘Round The World. His dad went to countless Yankees, Dodgers, and Giants games growing up, and after the Dodgers and Giants moved west, he found himself out there soon after. He just settled in the wrong part of California. You see, Mike and his family are Giants fans. For those of you who don’t follow baseball, the Dodgers and Giants are hated rivals. When I first met Mike, the Giants were in the World Series and he was so happy about it. When we went on our first date, they’d lost and I didn’t care that he was a hot guy I was attracted to, I ridiculed him mercilessly. I know had the situation been reversed, he would have done the same. We are not mature people, we are sports fans. There were lots of jokes about how we rooted for rival teams and how could we possibly be together, blah blah blah. Mike was just happy to be with a girl that liked baseball, he didn’t care that I rooted for the team he once referred to as “pure evil.” Of course, now that the Dodgers are responsible for our health insurance and putting food on our table, he refers to them as “slightly evil.” It’s a small distinction, but important. Everyone asks, “so, who will Maddie root for?” We take this seriously, of course. So we’ve set rules. 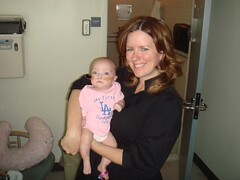 Whenever we go to Dodger games, here or away, Maddie will wear Dodger gear. The exception to this rule is when the Dodgers play in San Francisco. 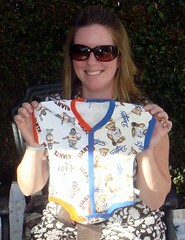 If we go to a game there, Maddie will dress neutrally OR wear her specially made half Dodgers, half Giants onesie. Yes, this may seem slightly unfair, but see that sentence about the Dodgers being responsible for our health insurance and putting food on our table? Dodgers get the edge. If we go to any game where the Giants are not playing the Dodgers, then Maddie will be decked out in the Orange and Black of the Giants. 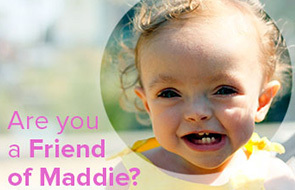 We plan to strictly follow these rules until November 11, 2015, Maddie’s eighth birthday. That is the day we have decided that she will be old enough to choose which team she wants to live and die with. I am confident that Maddie will go with the local boys, while Mike is secure that she will choose her father’s hometown favorite. Mike has his work cut out for him, though. Can he take her on the field at Phone Company Park, I ask? Can he introduce her to old time greats? She’s already met Tommy Lasorda. Did Willie Mays come visit my daughter in the hospital? No. So, in honor of Opening Day yesterday, let the brainwashing begin! Here is a picture of Maddie and me before I had to go to work yesterday (my boss would murder me if I missed opening day). 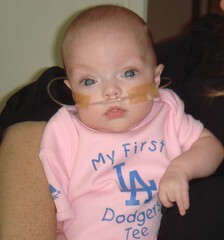 Doesn’t she look cute in her little Dodger shirt? Copyright The Spohrs 2007 – 2008. ALL RIGHTS RESERVED – that means NO STEALING! How many doctors does it take to screw in a light bulb?How many doctors does it take to screw in a light bulb? I love it. I blogged a few days ago about our family being diehard Red Sox fans. I do hope she’s doing better. She is just so sweet! Okay – you are the cutest mom I have ever read about. I love the enthusiasm about sports and how you have decided she can choose her own team. I recently lost my own dad, and let me tell you, without exaggeration, my most amazing memories with him involved us watching the Giants games. Don’t hyperventilate – I mean the football team in New York. i love it!!! you know, i grew up a dodger fan too…my mom grew up in east l.a. (meeting sandy koufax was a highlight)… and i went to game 2 of the ’88 world series (my bro went to game 1…so jealous) and the games 2 and 7 of the ncls. for passionate dodger and giant fans, i guess your marriage could be compared to a democrat marrying a republican. hahaha. but it works!!!! hugs, prayers, and kisses from mexico! go giants!! i’ll help you mike. what happens if she’s not a sports fan- will she be disowned? Well, we’re Angel fans…but we still love you guys. And afte rall, Maddie is a little angel LOL. I put her pic on my scrapbook page. And Heather, thanks for the good words over at my blog. Just coming over from the post about Annie’s first game. I think loyalty will be decided well before age 8. We are soccer fans in our house. My husband cheers for Liverpool and I am an Aston Villa fan. 3 of our 4 kids have chosen LIverpool and once could care less about any team. Needless to say, I watch any games where those 2 teams play one another on my own. I don’t need that abuse! .-= Emma´s last blog ..Sorry… =-. Ok, this is amazing. i just received a comment on one of my posts (I’ve attached it at the bottom) telling me to read this post and I am so glad I did!! I am a diehard Dodgers fan and my boyfriend is a diehard Giants fan and I think it’s such a fun rivalry! We went to the Dodgers/Giants game last weekend (on Saturday, when the Dodgers lost) and got so many comments about how we could be together when we liked rival teams. So next year she will get to make her decision, right? Do you have any idea which way she’ll go? I’m going to spend the rest of my day reading more of your posts. The jersey is amazing!